Sprawl, in many cases, is in the past tense. It’s already happened. Though it continues in plenty of places, it’s most problematic where it already exists. For booming regions, sprawlish suburban rings threaten to choke the central city with snarled traffic and lean tax rolls. Rather than throw their hands up in disgust and move on to a city that “gets” it, a group of planners and architects have focused on retrofitting diffuse neighborhoods and intensifying four lane boulevards. In the process, there are myriad problems to tackle, but I’d like to tackle one right now: What to do with suburban housing. Density is suburbia’s saving grace and Achille’s heal. Who wouldn’t want to be ensconced in their own private garden? But that same dispersed living isolates people and causes many of the headaches of daily life. Sprawl retrofit really means higher density living, which also means more shops close at hand and less time behind the wheel. It’s no secret that many suburban lots would easily support another house. Slapping another behind the existing one is a simple way to double the density. It’s a common approach to sprawl retrofit, and one raised at the 19th Congress for the New Urbanism. But if erecting backyard residences solves one set of headaches, it risks inflicting more in the process. Suburban homes were built with very specific ideals in mind. The front of the house is the public side, presenting its widest part to the street, shielding the backyard and creating a private area where people can relax in relative peace. While many early car-centric suburban houses reacted tepidly to the backyard—the best they offered were a few more windows and a back door—we soon became practiced in the art of suburbia. Large picture windows, sliding doors, four-season rooms, and covered porches quickly festooned the private side. The backyard became more than an outdoor amenity—it was a private garden to be enjoyed from the indoors, too. Hacking a lot in two and adding a second residence could destroy one of the few things many suburban homes have going for them—a sense of privacy. The attractiveness of this feature should not be underestimated. Research suggests that open views are help ensure a feeling of privacy, even more so than actual proximity. The bad of suburbia—houses turning their backs on the street—was driven by a noble aspiration—homes embracing the yard. No one wants their view to embrace another home, no matter how beautifully designed. And so a lynchpin of sprawl retrofit—boosting the number of houses—may be the most difficult to achieve. That’s not to say it cannot be done, but it will require careful consideration to do properly. Suburbia may be, in many ways, a consequence of bad planning, but it got one thing right—the yard. 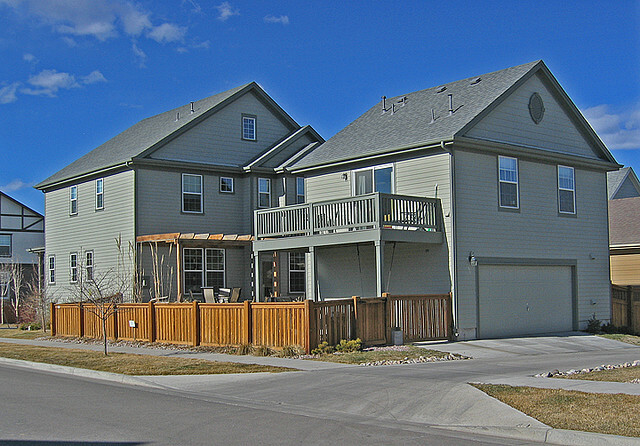 We crave green, open space, and suburban lots with suburban houses have it in spades. It may have given us too much, but we shouldn’t take it away in too much haste lest we compound the mistakes of the past.